For many business people, it is about facts and ROI. We live in a rational world, but consumers make decisions based, in part, on emotional connection. A new study shows that 85% of consumers say it is important or very important to them to do business with a company for which they have strong emotions, per survey results released in November 2012 by rbb Public Relations. And the industry for which it is most important is healthcare. Seventy-six percent (76%) of those responding feel that an emotional connection is very important with healthcare providers, more important than other industries. Value is connected to that emotion – of the 2,000 adults surveyed, 83 percent are willing to spend more on a product or service if they feel a personal connection to the company. One fifth of respondents said they would pay 50 percent or more if they felt the company put the customer first. Some of the brands that provide that “love” that consumers are looking for are – Apple, Amazon, Walmart, Costco, Southwest Airlines, Chick-fil-A, Toyota, Nordstrom, Starbucks and Ford. Each one of these brands has a very well-crafted brand strategy that identifies with their consumers wants and needs. That relationship keeps us coming back for the newest iPhone, free shipping, low prices, Rapid Rewards and the skinny Peppermint Mocha Latte. Missing from the top achievers are healthcare companies. Personal and proactive communication reduces anxiety and fear, fosters trust, instills confidence, makes people feel safe, informed, included, listened to and respected, and creates moments of compassion and empathy. 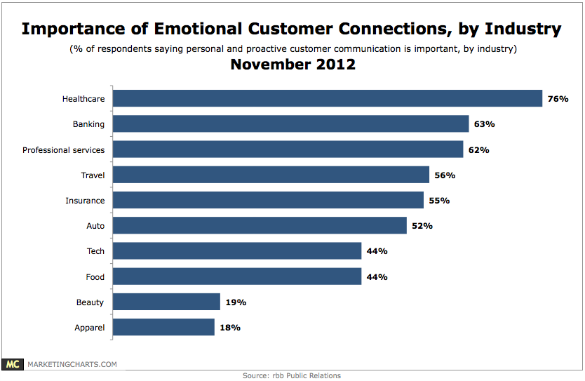 It is no wonder and surprise that emotional connections with customers are most important in healthcare. Definitely going to reblog and share on WomenCertified.com with our hundreds of partner hospitals! Over 700 hospitals are being recognized with the Women’s Chocie Awards in a number of categories from America’s Best Hosptials rated by women in Patient Experience, Obstetrics to Heart Care. We carry the torch touting the importance of an emotional connection and the value of a great patient / customer experience especially in healthcare where communication and happy patients will reduce costs and readmissions. Thanks Della. Would love to know more about WomenCertified.com. I would like to know what the survey question was that put healthcare at the top of the list, but then didn’t identify any healthcare organizations. Thanks. You are currently reading Marketing to Women: Emotional Connection Important for Healthcare at The Lipstick Economy.